The Story and legacy of Y-Knot-Creations…. It has been quite some time since my last blog promising to tell the story of YKC. In some measure the timing didn’t seem right back then, but as we approach Christmas I decided to share this story with you now since it is actually in its sense, a Christmas story…a story of hope, endurance and that, in the end, good things come. It is my hope that what I share with you here may inspire you. When I was married to my second husband, I had the chance to pursue something I had been eager to try; fly-fishing! After my first attempt I was hooked and sharing at least this one thing in common with him, we rented a cabin in Montana for a few years. I remember most vividly how miserable I felt when we returned to New York after that first year out West. The nature, the beauty, the silence…in my heart I knew Montana was to be my new home. The Y-Knot underwent 2 stages of renovation; the initial one and then a substantial one soon after that. It was in the early days after the first renovation and soon after we had just arrived back from New York, we were fast asleep one Sunday morning when we were awoken by a determined knock on the front door. Quickly slipping into a robe, my husband went to the door with me close behind. There was an elderly couple outside. "Hello, we are the Abrahamsson’s. We built this place. It was our dream home and we wondered if we may come in and see it one more?” Of course we invited them in. We quickly learned that some years ago this couple of very little means had scraped the money together to buy this beautiful piece of land; back then you could get it for a steal. The husband, Brian, had been working in construction and was able to get the left-over drywall scraps for free and literally pieced it together in the barn and the home. This explained the puzzle shaped wall pieces everywhere! After a thorough looking around, and discovering that there was very little to see except for the gutted skeleton, they sadly realized that their beloved spiral staircase was gone, replaced by new stairs, and the circling/spinning orange fireplace was gone as well… They shared with us how hard they had worked to own this little slice of beauty, their life dream, and how they had struggled to build it. One day, soon after they made it their cozy home, their daughter begged them to move to California to be closer to her and the grandchildren. No sooner had they sold the Y-Knot and moved there, that their daughter moved once again. Broken hearted, they realized that there was no going back to their place in Montana and that it was forever lost for them. They were now stuck in a small trailer in Southern California in a point of no return. The Abrahamssons stayed in touch for a long time after this and for Christmas they always sent dried-fruit from their garden in California but inevitably, we learned one day that Lowine had passed on. Time went by and after we sold our home in New York the Y-Knot was renovated once again, now unrecognizable from its original structure. The only memory inside was the edged Y-Knot emblem in the stacked stone fireplace. My marriage in the meantime became unbearable. I had actually thought for the longest time that abuse was normal, but it is not. My time at the Y-Knot ultimately became a matter of survival and I knew in my heart I had to leave. Meanwhile I had put so much art work and love into this place and had a beautiful studio set up but I just couldn't endure the constant abuse anymore. It was on Christmas Eve exactly 10 years ago that I left in what turned into a dramatic sequence of events. I shall not share the details but suffice to say that I left in urgent haste, with no help or support from anyone. In fact, it was disheartening to discover that the very people who felt sorry for me in those days, were the very first ones to make my situation even more difficult. These events drove me toward deciding to go full speed ahead and open my decorative painting business. Y-Knot-Ceations, LLC. Whilst circumstances made me unable to remain at the Abrahamsson’s dream home, I honored my promise and the pledge I made to maintain their legacy through Y-Knot-Creations. With every creation commissioned through YKC, whether make-overs or something new, I preserve a piece of the Abrahamsson legacy; after all, I made a promise and I take my promises very very seriously. Today YKC is thriving and 2016 has been our strongest and happiest year ever. As Christmas Eve approaches, I hold the Abrahamsons close in my heart and remain steadfast with my pledge. Although their legacy has slightly altered in its sense, it will never be forgotten and always upheld...To all those who endure abuse I implore you make that change and have the strength to leave your circumstance . Every day is a day you do not get back and you deserve to be happy and healthy. May you all find your dreams and may I wish you a very merry Christmas. Referring to my previous blog, I wish to pick up and highlight this daunting task. These days, in any society, it is so difficult to keep the youth motivated beyond computer or video games. Our children are so oversaturated with all of the technology available that it is hard to motivate them for any active or creative endeavors. Speaking for myself, I have always loved to create things from my earliest recollections. Not having many toys didn’t bother me as long as I had something to create with. Wrapping stones and making them into beautiful little parcels was one of my favorites; much to the demise of all the scotch tape at home! In fact, at one point, I believe I must have been 5 or so, I was convinced I would be a professional parcel wrapper. I am so glad I elevated on that creative level!! I hate to think how I could have made a decent living with such a skill, but when you are 5 things do look a lot different. With this memory in mind I have often watched throughout my travels many native children and their interaction or lack of enthusiasm for traditional art and craft. A trip to Gallup New Mexico one year brought this very problem to my attention. I was visiting Earl’s Cafe and was looking over the beautiful native American bead works. I picked up a tiny little weave (depicted here) and one of the ladies proclaimed that her niece had made this one and it was her very first piece ever and it would mean the world to her if it were sold. Picking up on this remark I quickly struck up a conversation with her and learned first hand how difficult it is these days to engage and teach the native American youth this art of bead work weaving and painting on hides and so forth. They have seen their parents and grand parents struggle and the all-time question arises — why should I bother with that when it doesn’t make any money anyway? I am glad that at the Inter-tribal ceremonial pow-wow in Gallup New Mexico every year, competitions are held to encourage those that are still eager and motivated to engage in these ancient crafts. A beautiful display is available and one can immerse into artworks incredibly elaborate and beautiful. Yet the danger lurks that fewer and fewer young people are eager to maintain this tradition, not to mention how hard it is to make a living doing this. Most often, they end up selling it to a Trading Post to get money, where their art and craft often generate a double or triple returns on the price simply because they can. The shops are the facilities with the capital and yet for the artists, putting food on the table at night is a difficult and imminent matter. Over the years, I have noticed the exhibits shrinking little by little; not enough to be noticed but it is definitely happening. Life on the reservation is such that crime and lack of ability to securely store elaborate Indian costumes, bonnets and prayer fans result in these historical and valuable relics of a past civilization being in many cases cases “pawned” throughout the year. These pawn shops are at least able to keep them secure and offer these somewhat fragile artifacts an adequate climate controlled storage. There is always quick money to be made by pawning these pieces of art with the obvious hope that by next year the native American artists will have enough money to once again retrieve their items for their upcoming ceremonials. Of course, the pawn loans are seldom paid back and so these beautiful pieces are sold off to tourists, never to be replaced. We also must not forget how hard it is for the Amish to encourage their young persons to their way of life and making a living. Right here at home in the US this is a very real and vivid concern. Can we assume that it will not be long before the Amish may “vanish” entirely? I for one love and enjoy buying a locally handmade craft, yet when we go to souvenir shops most likely our “local” souvenirs are made in China. In a world that is so consumed by technology, I reflect on all my interactions and experiences here and abroad. I treasure the time and creativity that goes into so many art pieces and not just fine or modern paintings and truly appreciate native crafts. But then again I am from a different generation. I hope with all my heart that we can encourage our youth in some way to maintain these traditions of tribal craft making but I simply don’t know how. All I can do is to spread a little of the wealth when I travel and buy local artists work along the way so they can feed their families and do what they love, but I am just one person. Artists around the world create, whether it be painting, carving, sculpting, leather work, jewelry, decorative art or any other creative medium. An artist painting on commission has the best possible scenario because she or he has the purchase commitment from the buyer prior to the creation. Many paintings we find in galleries wait for years for the right person to come along with the budget and appreciation to make the purchase. For decorative artists such as myself, there is the security of the commission prior to the work when the client hires one to do something specific, such as a cabinet make over or a new wall finish or even to match wood or a marble column. With constantly evolving and ever changing trends, a good decorative artist must stay on top of such trends by way of constant continuing education and exposure to new products. Phases come and go and these days, a more contemporary style is favored over an old world finish which is seemingly out of style and so, once again, the requirement for our skill may appear much more meager than in the early 2000’s. To sustain oneself as an artist takes a lot of work and this is not easy. I too have “diversified” and have the security of another income to meet my bills and obligations at the end of every month. Many fellow decorative artists that I know are not the major bread winners in the family so they don’t have the pressure to make that money, no matter the state of demands on their artistic talents. Today I wish to highlight and appreciate those who often get unrecognized on this subject. I am an avid world traveler and through my travels I have been inspired by many artists. Sadly though, I have also witnessed the terrible struggles of these artisans. The first time I was keenly made aware of this was in Gallup, New Mexico. I was sitting in Earl's Cafe where native Americans frequently came through the restaurant, offering their creations. I was somewhat surprised at how inexpensive these elaborate pieces were and bought several things before realizing that I simply couldn't buy something from every one of them. Once outside the cafe, I saw many other natives who had set up tables to sell their crafts and I watched as other people negotiated with the artists and saw lots of beautifully crafted pieces of artwork being sold at seriously undervalued pricing. Once, in Alaska where the inuit carve the most beautiful creations out of walrus tusk or whalebone, I saw a native on the street desperately trying to sell his elaborate piece; an item that would normally go in a gallery for 10 times the price, but he was desperate to have the cash to put food on the table that night. The most vivid experience of this kind I actually experienced in Africa. In Zimbabwe & South Africa where I spent most of my time, I watched many natives selling their beautiful creations, absolutely phenomenal carvings for next to nothing and again I watched shoppers bargaining them down to the bone. For these people, creativity is not a luxury but a means of survival. They have to be creative just to buy food and necessities and are often waiting for days to make a sale. Never mind that location is also a huge matter, whereby if you are lucky enough to sell your items in a shop versus on a blanket in a remote area amongst all those others, you may get a better price. In the Matopos in Zimbabwe I fell in love with the artisans there and that day I only carried a small amount of cash. There were 31 vendors and I was determined I would try to buy at least a little something from everyone, not withstanding how to get it all home and how much could I fit into my small house. When I see fellow artists struggle, my big heart seems to get the best of me and I just wished I could help everyone, but of course that is not possible. While in Nepal and India, I noticed the the exact same phenomenon with their natives special artwork, especially in India. Tourists are hunted down and eagerly invited to buy something and the bargaining down begins. I don’t bargain with these artisans but more often than not, actually give them a little more. It frustrates me to a great extend watching other tourists go to the bare minimum as I have seen yet again on a most recent experience in Ecuador. The exquisite wool creations, carvings, and weavings are simply amazing. I went to several artisan markets there and witnessed much the same as I have seen all around the world; how artisans have to be creative out of necessity. Thus they are already at a disadvantage starting out with the “beholding of bargaining power” of the potential customer. I bought 11 finger puppets and each one cost a dollar. I actually had someone criticizing me paying 11 dollars instead of bargaining to down to $10. I sharply retorted that if I can spend $5 on a Starbucks drink in the US where I live, I certainly don’t need to make or break that important $1 dollar by bargaining with the artisan. Sadly, this kind of attitude is all around me. I have struggled over the years to keep my business alive but again, my line of creativity is also linked to a service in the areas of cabinet makeovers and home improvements thru decorative & vertical concrete and I “make ordinary things look extraordinary.” I feel very blessed that diversifying my work has helped me keep things afloat and I have a deep appreciation for all those who have such creative skills but can only use them to put food in their belly. Todays message is to appeal to your kindness and search your heart; do you really need to bargain to rock bottom because you are in that position or could you just pay those extra couple of dollars that are a make or break kind of a thing to the artisans? I refer to my souvenirs of artist creations as treasures…perhaps one should do the same. I have seen KARMA too, but that is for another subject!!! As for putting it all in perspective on another level, lets highlight Van Gogh who sold one one painting for $80 and look today at what fortunes are to be paid for his creations. At least on our level when we purchase something from artisans, they are affordable. We are alive to enjoy them as is the artist who is glad to provide for themselves and their families with your purchase. Please keep that in mind next time you feel you need to became a fierce bargainer when you purchase a souvenir treasure. This blog is dedicated to all of those artists around the world who struggle to make ends meet and yet will still part with their pieces of art for just enough to survive... I wish to thank all the native artisans for their generosity, inspiration, and their great kindness toward me. Up next in my blog : The art of keeping art alive …. the difficulty of passing on ancient artwork creations…..
A few weeks ago I was shocked to learn that Hancock Fabrics, perhaps the most popular source of fabrics and notions nationwide here in the US, was going out of business. Over the years, Hancock Fabrics has always been my #1 place to go to for all varieties of fabrics and such so these last few days have been bittersweet. 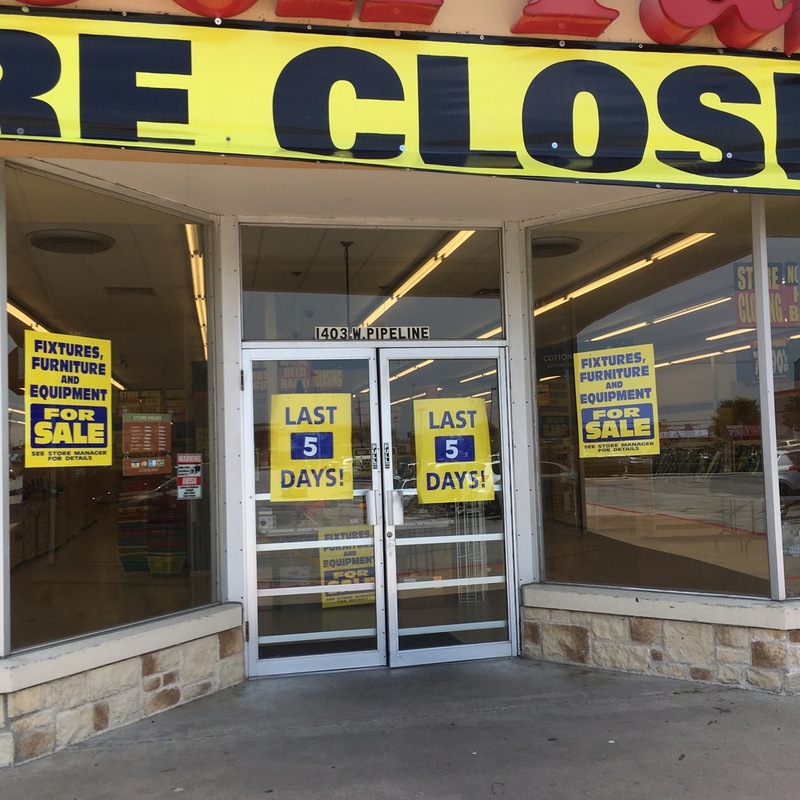 I visited the store on Pipeline Road frequently and witnessed this iconic store shrinking down in inventory and merchandise, furniture and fixtures, bit by bit. I have never been one to enjoy feasting on someone else misfortune but I must admit I consider myself lucky to have been able to purchase some extraordinary fixtures for my YKC studio that otherwise would not have been available nor affordable to me. I find it comforting that these items found a good new home where they are greatly appreciated. During these last few days I have been shocked to observe customers acting like vultures, bickering over items that were already marked down 85 % and more. What was particularly disheartening was to watch how hardly anybody gave consideration to the ladies working there who were about to lose their jobs after the store was liquidated. Hancock Fabrics was a mad house for weeks and nobody knew how long this frenzy would last. Eventually a sign was placed on the front door: " Closing in 16 days” and the reality really sunk in that these wonderful sales ladies were unemployed after this countdown. It was on that day when the sign was placed that I found myself in the store again and it was depressing to see the stress of impending doom in the staff’s eyes and on their faces. I remembered all these years I fought for my own business, Y-Knot-Creations to stay afloat when times were slim. Once I had to walk away from what seemed to be a promising future out West due to the changing of my personal circumstances and had to start over again here in Texas. Sometimes I wonder who saved whom: did I save YKC or did YKC save me? Today I cannot even imagine losing my business and studio, yet the future seems so fragile with the whole world and the economy on the brink. My craft is deemed a luxury. I learned how to knit and crochet in elementary school; it was mandatory then back in Germany. We were the last gasping breaths of an era to have learned these skills before technology really started taking over. Today I lack the comprehension of technology, but thanks to APPLE and my steady commitment to workshops I seem to have gained a deeper understanding of this elusive and fickle aspect of our daily lives. So, what happened to Hancock Fabrics? As a 51 year old, I was astonished to see the great amount of customers who bought these close-out materials because they were cheap, clearly not knowing what to do with them. I noticed questions being asked at the always busy cash register on how to knit or crochet. At one point watching all this madness I turned to Lynette, one of my favorite sales ladies and said: "Heavens forbid if we put a darning egg out, they would have no idea what to do with that!" Am I the only one left who knows how to darn a sock? In the old days it was the only way to fix socks and women were tasked to sew and stitch. Not so much anymore. “ Made in China” kind of discouraged that skill. Why fix something if we can buy it for cheap? Creativity is a luxury that is a dose of reality, especially when the economy is weakened. And speaking of being “weakened,” it is when one is weak that the vultures will come and pick on you mercilessly. I have encountered that personally in my past. Then, there is creativity out of Necessity, [please look for this subject in my next blog] such as the African natives carving and creating the most beautiful wood sculptures just to survive and feed themselves. Every so often having to give their hard work away to the vultures for the equivalent of just a few dollars, simply to be able to buy food at night. Right now in the USA, the Amish provide another example of struggling with how to keep their culture and way of life and encourage their offspring to maintain that lifestyle and tradition. There are so many facets to this subject but the closest to my heart are the Native American Indian and Inuit. We took away their culture little by little over a 200 years period. I have been greatly inspired by their artwork and it breaks my heart to observe how hard it is for the elders to encourage their young to create, carve and weave. May native art be one that will also perish one day? I would dread that day and I can only hope not. Kindness is a weakness now. It was with a heavy heart that I stood in front of the Hancock Fabric store yesterday while they put up the sign “STORE CLOSED.” Where am I going to buy my fabric now, with limited shops available? These days spent watching this process compelled me to try with all my heart to make a difference, no matter how small. I brought the entire staff an ample selection of hand-crafted cup cakes in appreciation of all the years they had provided me with fabulous service. When I bid Lynette farewell she said; "Eva, after meeting you I will no longer look at kindness as a weakness but now as a great strength.” What a lovely and profound remark! In closing I would say that inspiration can come from all sources, as with creativity, but for me, it is special when coming from the heart!